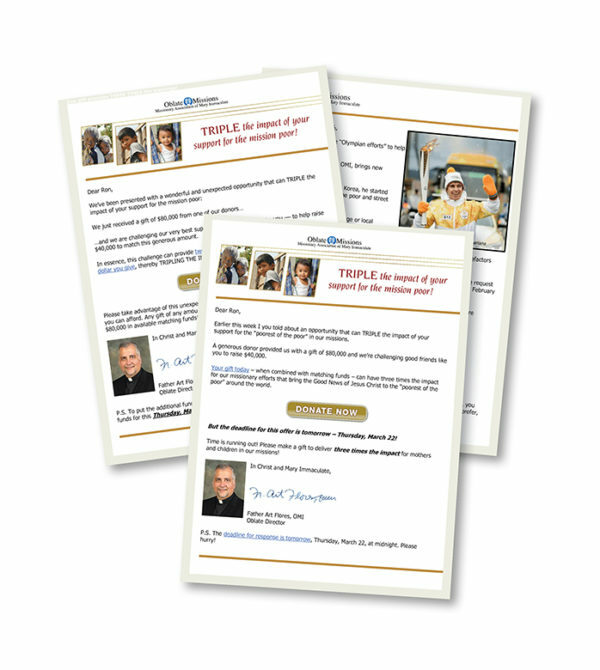 In FY16 and years prior, Oblate Missions had a very successful direct mail program but had limited online marketing activity, generating minimal online revenue. MarkeTeam developed an email communication strategy as part of an overall multi-channel strategy to improve the donor journey, increase revenue and optimize the overall communication plan. The email program launched in fall 2016. MarkeTeam’s approach focused on two main goals: cultivation of donor relationships through engagement opportunities such as online prayer petitions, and generate short and long-term revenue growth. Under the full design, strategy and management by MarkeTeam, the content and delivery of key messages became consistent (and when appropriate, coordinated) through direct mail, email communications and website promotions. Thus, the donor experience was unified and seamless, regardless of the donors’ preferred channel(s), further broadening the donors’ bond to the mission. Developing an email communication strategy paralleling much of the existing, proven direct response efforts. Expanding the mailable email address base. Creating landing pages and donation forms that ensured the donor experience paralleled the direct mail experience. After 14 months since the initial launch, the email address universe has grown to 60K+ donors across multiple channels. Open rates and click through rates regularly exceed industry benchmarks. The number of online gifts is up by 34% and online revenue is up 44% year-to-date over the initial year of the digital fundraising effort. FY18 online revenue is projected to double that of FY17. MarkeTeam is currently implementing the next phase of Oblate Missions’ digital strategy with the management of their Google AdWords Grant.